The market focus throughout September was primarily on an increase in cotton and cottonseed production, cotton crop progress and conditions, weather events across regions, and continued US trade talks with China along with Mexico and Canada. 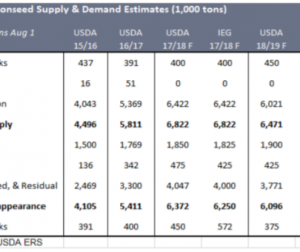 USDA released its Oil Crops Outlook report September 14 and it showed an increase in 2018/19 cottonseed production by 356,000 tons. 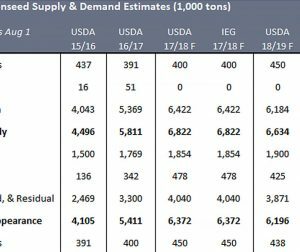 Informa Economics IEG also increased its 2018/19 cottonseed production by 305,000 tons. Along with the increase in cottonseed production, cotton conditions for were reported as improved conditions for the last two weeks of the month. Harvest is underway for most of the Delta, Mid-South, and Southeast areas with California, Arizona and other Far West states expected to start in October. Good cotton quality and yields are expected in most areas given weather does not hinder the harvest progress further. In the latest USDA’s Crop Progress report released on September 24, cotton harvested was reported at 16 percent. This is well ahead of the four-year average of nine percent with harvest expected to continue ahead of average as the weather outlook for October remains favorable for harvest activity.